Both types of U.S. bluestone have long been used as pavers in hardscapes. Bluestone is durable, attractive, and ideal for all kinds of uses including patios, pool decks, stone steps or entryways. Shenandoah Bluestone is a grayish-blue and becomes grayer as time goes on. Pennsylvania Bluestone's color depends on where it was mined and can vary from tan, rust, blue, brown, or gray. Bluestone pavers come in several sizes and shapes: they may be cut in uniform sizes such as squares or rectangles, or they might be cut for a more natural look with jagged edges and irregular shapes. What you use in your paving project is a matter of taste, although the irregular sizes lend themselves to more free-form designs such as walkways and stepping stones. Uniform pieces will be easier to work with, of course, since mapping out the area to cover will require less work. Bluestone is durable and will last many years. It can stand all kinds of weather and handles temperature fluctuations, so you can incorporate it into your landscape wherever you live, whether you endure snow and ice or desert heat. Its natural earth-tone colors are gracious and attractive and complement almost any landscape. Its rough surface also means that it rarely gets slick or slippery. Further, it's readily available and it comes from United States' quarries, so there is no overseas shipping to add to its cost, which is already somewhat high. An obvious disadvantage to bluestone is its cost — any natural material will be more expensive than a manmade material such as concrete pavers or bricks, and bluestone is especially prized for its beauty. It can be harder to install bluestone than concrete or bricks because it is commonly irregularly shaped and also may not have a standard depth. The darker colors can get hot, so bluestone might not be a good choice pool-side where you and your family are walking barefoot. Another consideration is that you will need to seal it to protect it from damage due to debris, salt or chemicals, such as chlorine. Before choosing your bluestone pavers, first decide whether you want irregular pavers or uniform size pavers. Irregular will be harder to install but may fit better with your existing garden design. Be aware that bluestone is a natural material, and so even uniform sizes will have imperfections: small clefts or crevices, or rust stains, for instance. Consider these irregularities part of the beauty of the stone. Bluestone generally is an inch to an inch and a half thick. Typically, a palette of 1.5" bluestone covers about 180 square feet, while one-inch thick bluestone will cover approximately 220 square feet. 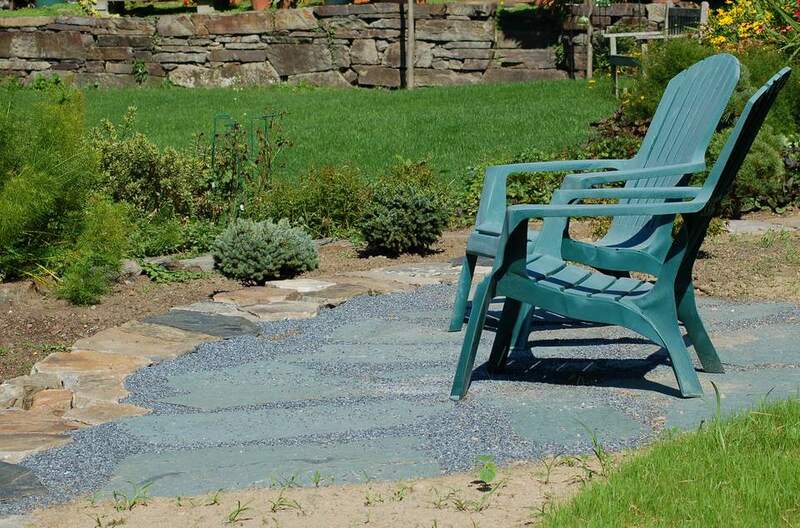 You can install bluestone on a range of materials including sand, cement or gravel, like most other pavers.